Properties in Vallery average 4.6 out of 5 stars. Property 9: Country house renovated nineteenth on 5000m2 of land. We loved our stay at the house Barbey. This renovated farm has a lot of character like the owners. We loved our stay at Barbey! 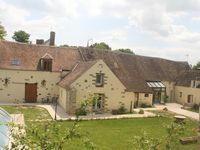 This renovated farm along with the entire property was amazing: very spacious, warm, green, nice decor modern/countryside, calm, well equipped with many showers/restrooms/bedrooms. Virginie and her family were excellent hosts and were always accommodating and available for whatever we needed. We celebrated my Mom's 80th Birthday with our families and enjoyed the swimming pool and barbecue with friends on sunny days. It is the perfect place for a big group looking for a nice getaway (up to 15 people can sleeep there) outside of Paris to rest or celebrate an event. We definitely recommend and would absolutely come back should we need to stay near Paris again in the future.